It would take an additional year, and cost an additional billion dollars to modify the plan to connect Caltrain to downtown San Francisco with a design that knits the city together, according to the results of a multi-year study by the San Francisco planning department. An extended tunnel would extend past the current stop at 4th and Townsend, along Pennsylvania to past the current 22nd street station. New neighborhoods, workplaces, and institutions in the former industrial waterfront at Mission Bay and Dogpatch would be connected over a mile where those neighborhoods are currently separated by rail yards at 5th and 6th streets, and by rail tracks at 16th/7th and Mission Bay.Â These growing neighborhoods are expecting 20,000 new households and 35,000 new jobs. While the team working on the study had initially leaned toward a Mission Bay alignment, the analysis concluded that the tunnel would need to go much deeper under Mission Creek, leading to higher costs and longer construction time, and ridership would be lower, because half of the 10-minute “walkshed” around the station would be in San Francisco Bay, with resident seals and seagulls that don’t use transit. The Mission Bay alignment was rejected because it was estimated to cost an additional $3Billion and to take an additional 4 years to built. The alternative, if the tunnel isn’t extended, would be a roadway underpass that would be .6 miles in length and 35-50 feet deep,Â and wouldÂ turn cross streets into cul de sacs.Â Â Without an underpass or tunnel, studies predict that the at-grade crossings are predicted to see delays of up to 20 minutes at a time with future increased rail service from Caltrain and High Speed Rail, among other problems blocking emergency access to the UCSF medical center. A replacement station for 22nd Street is included in the high-level price estimate, and the city will explore options for that station after and assuming city elected leaders approve the Pennsylvania alignment this fall. The study concludes that the Pennsylvania extension could be implemented without affecting the schedule of the currently planned rail connection, which is currently in the final engineering design stages.Â The underground 4th and Townsend station is being designed to accommodate the potential for an extended tunnel. The study assertsÂ that work on the connection from Transbay to 4th could move forward and complete,Â and the extended tunnel could be continued a and completed a year after that.Â Much additional design and engineering would be needed to verify the possibility of such a schedule, considering (among other things) a new 22nd street replacement station with a location that hasn’t been selected. The extended tunnel options would require Caltrain to store and maintain trains elsewhere, within a 10-minute train trip of downtown.Â Two as-yet undisclosed locations are being studied, one in San Francisco and the other outside San Francisco (which logicallyÂ might be the Brisbane location that High Speed Rail is planning for its railyards). 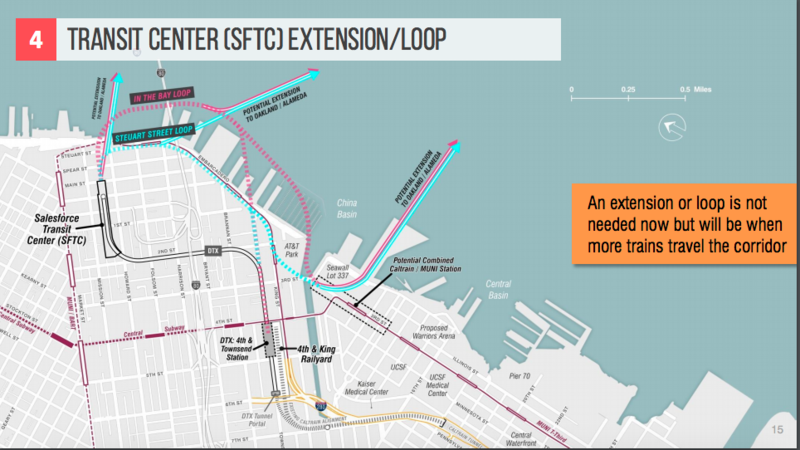 This would allow development of homes, retail, and office space currently occupied by train storage and maintenance, and connections of 5th and 6th streets across from SOMA to Mission Bay. Such development could contribute funding to the rail infrastructure project. 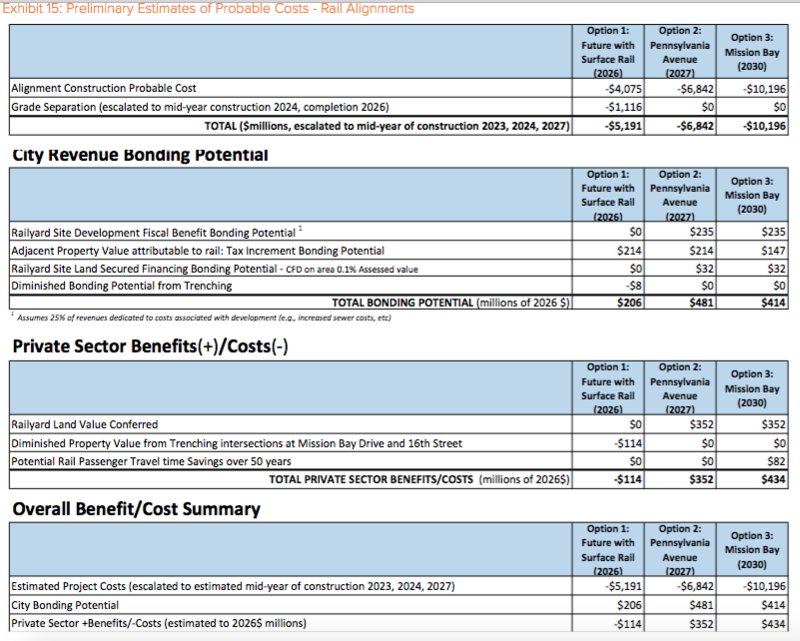 However, because the land is owned by Prologis, a private owner, the public bonding revenue would be lower than public land, approximately $480Million. 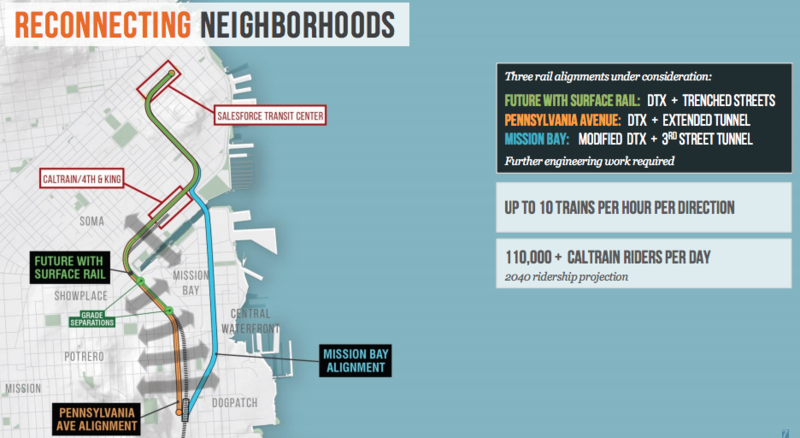 The study considered future options that could extend the tracks across the bay, with a second Transbay rail crossing that could bring regional/high speed rail to Oakland and on to Sacramento. At the Citizens’ Working Group workshop on 5/21, planning staff noted that the city is having early discussions with the Port of San Francisco to prepare to punch a hole through the seawall to allow for a second rail crossing. The strategies to connectÂ rail lines designed as “commuter rail” systems,Â stoppingÂ a mile out of downtownÂ – to extending the line into the heart of downtown, and then to connect the tracks throughÂ to other side of the region – are strategies that have been used repeatedly around the world over the last 50-60 years, in metropolitan areas including Tokyo, Munich, London and Paris, with great success. Around the world, these strategies – connecting downtown, and running through to the other side of the region – have resulted in dramatically increased ridership, by knitting former “commuter rail” lines into the core transit of the metropolitan area, and also supporting longer-distance regional trips, generatingÂ muchÂ more ridership per mile of steel and concrete than a limited, peak-focused commuter rail service. 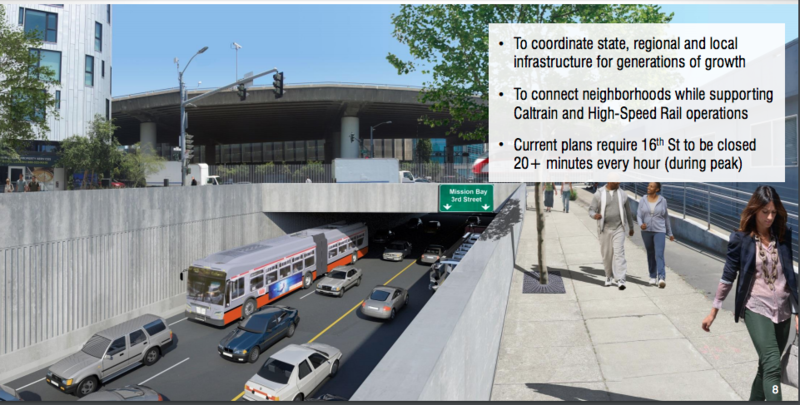 At the first presentation to the San Francisco County Transportation Authority Board – which would need to support funding for the project – Chair Peskin reiterated support to connect the tracks to the downtown Transbay station. At that presentation, citizen advocates who had previously been opposed Â to the alternative alignment are no longer opposed;Â though withÂ recommendations to keep the railyard function in place and build above the railyards instead of moving railyards; and to use the city’s bonding capacity to cover the extra cost of the grade separation that delivering additional local valueÂ connecting the city. The next step will be a public workshop on May 29 at Herbst Theater,Â 401 Van Ness Ave.
Planning Commission will hear an update on June 7, with other boards, commissions, and community groups getting updates and providing feedback in June and July, including San Francisco Transit Riders Transit Advocacy Committee on June 11. Finally, the Mayor and Board of Supervisors would make a decision about the alignment in a joint resolution, either in July or September. This would be an important decision that would set the stage for San Francisco’s commitment to funding their share of this important regional connection. The Pennsylvania Ave alignment is probably the best one as it keeps both 22nd Street and 4th & King stations around. It’s slower due to the extra turns, but isn’t challenging to build and cost much easier to swallow. My personal objection is that more people can quickly get to the existing stations vs a Mission Bay station that is at edge of town, and let’s face it, not as easy to get to. The Pennsylvania Ave alignment is the best one because it merges 22nd Street and 4th&King into a single 7th&King station.